A view of the 'false' Esk Hause from the true Esk Hause. True Esk Hause is the top of the Esk valley, and is between Great End and Esk Pike. 'False' Esk Hause is between True Esk Hause and Allen Crag, and is on the path from Angle Tarn to Sty Head. 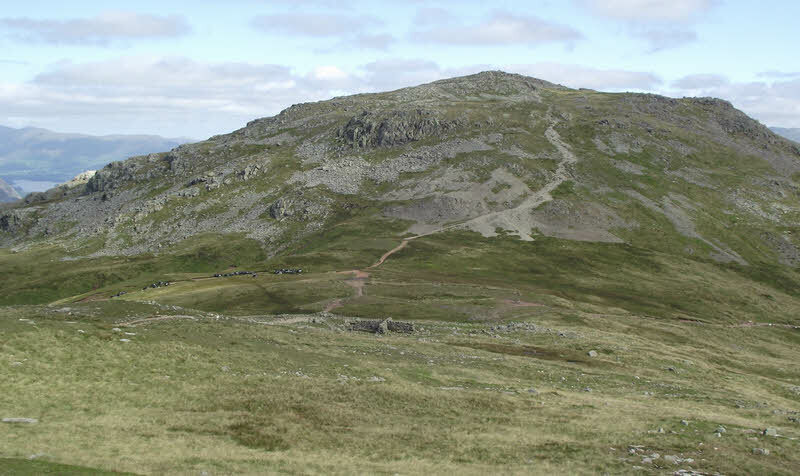 This is the route used by people climbing Scafell Pike from Great Langdale and Langstrath. On this view Sty Head is to the left, Angle Tarn to the right. The most popular path up Scafell Pike from Sty Head now misses both the true and the false Esk Hause, and takes a short-cut that leaves the old path near the top of Ruddy Gill and rejoins it above Esk Hause. Note the cross shaped shelter at 'false' Esk Hause.